Sister Mary Antoinette (Patricia Anastasia Oliva Marshall) was one of 8 siblings – 2 brothers and 5 sisters. Antoinette was number 6 in the family. She started her formation at Heretaunga in 1948 and was professed on February 11, 1951. After profession she was assigned to the Novitiate Staff until August the following year. In October 1952 Mary Antoinette was missioned to Killara in Sydney, Australia for four months then to Wahroonga in January, 1953 where she remained in until 1959. She worked in different community services and the Altar Breads. She also did a teachers training course in 1956-1957. Over the next five years she was assigned to Deer Park, in Melbourne where she taught and gave community services until she was transferred back to New Zealand in the beginning of 1964. From there she was missioned to Fiji in February that year. She spent the next eight years serving as a teacher in various mission stations: St Mary’s, Suva, Naililili and Sigatoka. She was a dedicated teacher who gave of herself fully in whatever she was asked to undertake. Mary Antoinette was assigned to the Novitiate staff again in January 1971 to be in charge of the kitchen and the garden. She was there until February 1974 when she attended an SMSM four months spiritual renewal at Maryknoll, Napier. She was reassigned to Fiji in the beginning of 1975 to the communities of St Mary’s Suva, Taveuni and Sigatoka. Mary Antoinette returned to New Zealand at the end of 1980 and spent the next 33 years in different communities in Wellington, Auckland and the Chatham Islands. Mary Antoinette moved to St Catherine’s Rest Home in 2007 then to Mercy Parklands where until the end of her earthly journey. She was thoughtful and generous in her love for others. Sister Rose McAloon remembers when she herself was the only SMSM in the Cook Islands that Mary Antoinette used to find out when the Cluny sisters were making a trip there and she never failed to send sweets along with a letter. This kindness and thoughtfulness was typical of Mary Antoinette. Some remember her as the backbone of the community, helping with the garden, the kitchen and hospitality. She used to walk around the neighbourhood and visit, often taking a bit of home cooking. During her time in Grey Lynn she was in charge of the Altar Breads. She also used to go with Sr Lasela to the Samoan choir and then to help with people with disabilities with whom Lasela worked. This ministry required the ability to use Sign Language. Mary Antoinette did not have any skills in sign language but she definitely had plenty of LOVE, the language of the heart. She was able to reach out by her presence, making the people feel special and loved. 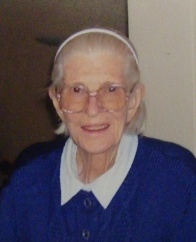 Sr Mary Antoinette had a great love for her family, our sisters and all those she encountered in her life. Mary Antoinette was a deeply prayerful woman with a great simplicity. She was full of gratitude to those who took care of her, or visited her. The second reading we chose for her funeral mass was from 1 Corinthians 13: 1-7. The theme is LOVE. This sums up her life of humble service and faith-filled response to God’s invitation to live the Gospel daily as a Missionary Sister of the Society of Mary. Yes, our beloved Mary Antoinette was an inspiration to us all. We thank her for the joy she gave us in sharing her gift of yodelling. May she continue to yodel in heaven. Let us thank God for the long and faithful life or Mary Antoinette, a life completely given for others in simplicity and joy. “Well done, good and faithful servant; come on in and share my happiness” (Mt 25:23).